The STEPS Case studies are available in various formats. Below is an Overview table of the school-based programs at each of the five universities involved in the STEPS Project. For a summary of each program, click on the above tabs. For a more detailed case study download the Case Study Report. the nature of the partnership and the degree to which teacher professional development is incorporated into the partnership. Despite this diversity, a common core exists that involves a commitment to bridging theory-practice through providing for authentic teaching experiences, where pre-service teachers take responsibility for planning and implementing curriculum while supported by academics in partnership with teachers, then reflect on that practice. While these programs must be evolving and responsive to local needs, this core commitment persists. School-based approaches have a long history at Deakin: 25 years at Burwood, 14 years at Waurn Ponds and 9 years at Warrnambool. The use of schools in the preparation of science teachers was instigated in order to give pre-service teachers an experience of teaching science concepts to children while being supported by tutors. The structure of the school-based experience has changed over the years. Initially it was the only mode of delivery when there was one science unit in the B.Edu. course. The current school-based experience is used in the second of two science education units. In the first unit, students undertake a two-lesson sequence with school children focusing on probing science understandings. The second unit focuses on building, planning for, and analysing the growth of children's ideas over a whole unit of work, drawing heavily on the 5E Instructional model. Until 2014, the unit is delivered in third year. Workshops include, approximately, a 1 hour tutorial focusing on pedagogical strategies and science concepts, 1 hour of interaction with children, and 1 hour of reflection on practice. Variation exists between the three Deakin campuses in terms of the partnership arrangements, how the three hours are used, group size of children, the number of schools involved, and the age of children involved. This program has received high pre-service teacher satisfaction ratings over the years, for example 99% of pre-service teachers indicated that working with children in schools was a supportive aspect of the course (2000-2002). The quality and success of the program is also demonstrated by: the increased number of schools involved on all campuses, and the ongoing partnerships with schools who have been involved over many years. Also, schools are increasingly embedding the Deakin science experience in their school community activities, for example, one school has an annual science night that incorporates the Deakin science students. One of the reasons I love having pre-service teachers in our school is they challenge our existing staff in their energy, and in their understanding of contemporary learning… I have great joy in seeing the kids out in the yard doing their learning, in the sand pit and in the vegetable patch and on the oval. From 2015, this third year unit moves to fourth year and the focus will shift to teacher readiness. Partnerships with schools will incorporate experiences where pre-service teachers have a more authentic engagement with the profession by interacting with the schoolteachers in a more substantial way. The RMIT Science Program was initially conceptualised to provide our pre-service teachers with authentic opportunities to engage primary children in science. The hope was to develop pre-service teachers' confidence in order to tackle the challenges of science teaching when they began their future practice. 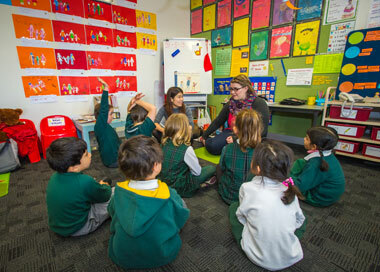 After the 2007 pilot program, pre-service teachers reported high levels of satisfaction with the initial pilot and the program was expanded across the entire primary program at Bundoora campus. In 2010, the program was expanded to include the new BEd course at RMIT's Brunswick campus. Alongside the positive outcomes for the pre-service teachers, it became increasingly clear that there were also significant outcomes for the primary students, classroom teachers, and the school community. The positive outcomes for all the stakeholders were what ensured that the unit continued and expanded. Currently, the RMIT school-based science program involves seven primary partner schools in the greater Melbourne area. This course provides pre-service teachers the opportunities to challenge their preconceived notions for science practice in a supportive, team atmosphere. Consequently, they are able to take on the challenge of teaching using inquiry-based practices, which research has proven to be most effective with children. The RMIT science education program consists of a compulsory two semester sequence. The first is university-based and is designed to prepare pre-service teachers with theoretical and pedagogical knowledge to design effective 5 E inquiry units. The following semester, pre-service teachers design original units based on the content needs of the partner school. They construct these units over a series of weeks with support from the university team and deliver them in primary classrooms at the close of the semester. During the 2013 second semester experience, the pre-service teachers wrote and developed their unit in the first 5 weeks of the semester. They worked in teams of 5 and were supported in three hour tutorial/workshop sessions over that 5 week period to write a seven lesson sequence that followed the 5Es format of Primary Connections. There is much evidence that pre-service teachers have positive experiences during the two semester school-based sequence. Compared to the RMIT School of Education 'overall satisfaction rating' of 74%, the rating of the science program over the last four semesters been 100%. Pre-service teachers' written comments also highlight their increased confidence when it comes to teaching science. Engaging, challenging, and rewarding course - the application of theory and the opportunity to practise it in a real classroom with our peers is an invaluable experience. Teachers also articulated the seriousness with which pre-service teachers approached their work in schools, as evidenced by the words of one of our cooperating teachers. The RMIT student teachers thoroughly prepared and presented science concepts with a developmental hands-on approach...Activities were well organised and well prepared. They were highly engaging and really encouraged students to do the thinking for themselves. The Primary Science Education program has responded to research that indicates primary teachers need extensive experience and confidence to teach primary science in classrooms. The MGSE program seeks to provide knowledge, experience and skills to teach science through an in-class teaching requirement, workshops and lectures. Since the 1990's when the B.Edu program ran school-based science programs, pre-service teachers have taught science units in classrooms. The school-based experience now reflects the M.Teach clinical model of teaching. The pre-service teachers, called teacher candidates, teach a sequence of lessons and develop a unit of science teaching. Teacher candidates are expected to teach science education to a whole class. They teach their science programs through the MGSE clinical teaching model . They seek to be diagnostic, interventionist teachers responding to a learner's identified teaching needs. They use student work as evidence that informs the sequence of science teaching. Science education is part of the core program for Master of Teaching primary teacher candidates in the first semester of their second year. The school-based component of the Primary Science Education program embeds into the Master of Teaching program, with two days each week in a classroom setting. They also participate in 2 x one-hour lectures and 1 x two-hour campus-based workshops per week. This occurs while they are teaching their science units in classrooms, supported by their classroom-based Mentor Teacher. In addition they receive support from a school-based Teaching Fellow and a MGSE Clinical Specialist. Teacher candidates stay in the same school for a year. The Teaching Fellow and Clinical Specialist meet with the science education academics leading the subject before each semester. The Teaching Fellow and Clinical Specialist source a Mentor teacher who has planned to teach science to their class. The teacher candidates work with these class teachers to develop a unit, adapted to the science learning needs and interests of the students. The unit keeps the science focus uppermost, but blends technology, literacy and numeracy into the class-based experiences. The Science Education program immersed teacher candidates in real science education. The lessons and activities ranged from Harry Potter themed inquiry lessons to chocolate investigations. This course and the instructors created passion and joy in learning. I can honestly say it was the positive example upon which I base my current teaching. A partnership approach to science teacher education was developed for final year pre- service teachers in the Bachelor of Education (Primary) at the University of Tasmania and conducted in 2007, 2008 and 2010. Pre-service teachers in their final year are offered a science education elective in which they work collaboratively in the class of a local volunteer teacher. They plan and teach a unit of work in science in the teacher's classroom. We went out into schools and taught. It was the biggest learning experience for me … It was hard to do with the workload, but we had release time from class. Actually had to get organised and put theory into practice. The thing was theory into practice. We were a bit sick of theory and wanted to bring it all back and relate it. Unit plans and designs - let's see it. It was really valuable to me. During the first four weeks of the unit teachers meet with the pre-service teachers to establish the partnership and begin the planning process. Each week, pre-service teachers teach at least a 2-hour block of science over a six-week period. In this time they explore science ideas and processes with their class of children. The science education lecturer supports the pre-service teachers to develop an inquiry approach that incorporates hands-on experiences, focused conceptual development, and embedded assessment. The role of the teacher and science education lecturer is largely supportive rather than supervisory. It allowed me to reflect upon my own teaching by observing and assisting. It reinforced just how different children learn and how much they rely on their prior knowledge and experience when completing tasks - particularly when predicting and recording observations and results. The pre-service teachers prepare an assessment of several of the children in the class, weekly reflective exercises, and a science portfolio that can be used when applying for teaching positions. The program forms a major learning and assessment task for the pre-service teachers who participate. They are assessed on the quality of the inquiry plan and on their portfolio. They are not assessed on their actual teaching; however, their teaching experiences provide an essential basis for their reflections. Pre-service teachers do not attend tutorials during the teaching period but return after the teaching to debrief and share experiences and complete their portfolio. Pre-service teachers, classroom teachers and principals all value the experience because they see how engaged the children are. There are multiple benefits for everyone involved. The interest came from teachers. Teachers are aware of the importance and value of this curriculum area. They take advantage of local resources to assist in provision for students e.g. Science Talent Search. The new Tasmanian curriculum plus the knowledge that a national curriculum is around the corner has highlighted the need to look more closely at the teaching and learning of science in a cohesive way. A school-based approach to science teacher education has been a core component of the Bachelor of Education (Primary) and Bachelor of Early Childhood and Primary Education courses at ACU Ballarat since 2008. Initially, the program involved groups of 4 or 5 pre-service teachers planning, implementing and reporting on a mini-unit of science. In response to feedback from the pre-service teaches involved, the program was recently changed to involve pre-service teachers working in smaller groups. Currently, the program involves a pair of pre-service teachers working collaboratively to plan, co-teach, report and reflect on a 5-week mini-unit of science. 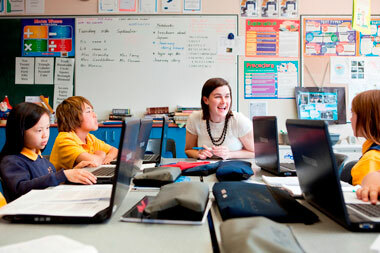 Pre-service teachers work in Ballarat schools in blocks of 1.5-2 hours per week across a five-week period. In this time they explore science ideas and processes with their class of children. Their mini-units are planned around the 5Es inquiry framework, which helps to ensure that there are a lot of hands-on experiences supported by conceptual development and embedded assessment. The benefit of having both the Primary and the Early Childhood and Primary courses in the program means that all primary school levels (Prep - Grade 6) have the opportunity to be involved. Pre-service teachers also write a report for each child in their class, which is returned to the school and often sent home to parents as a part of the school's formal reporting process. Being in a school and actually being able to apply my knowledge in a real world environment has helped my understanding of science teaching. The program forms a major learning and assessment task for pre-service teachers. They are assessed on the quality of the inquiry plan and on the reports they write on children's learning. They are not assessed on their actual teaching, however, this does provide an essential basis for their reflective thinking and writing, which then forms part of their assessment. Pre-service teachers receive time in lieu of science tutorials, but still attend university for science lectures where they debrief and share ideas for improving their science teaching practice. Pre-service teachers, classroom teachers and principals all value the experience because they see how engaged the children are. It was great the girls were questioning the whole time they just didn't stand back and observe they were right in amongst it.